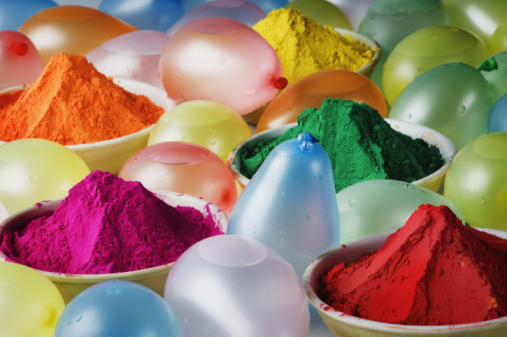 If you’ve played paintball and thought it was the most fun you could have with color, then you have been sadly mistaken; to you I introduce Holi. One of the most colorful festivals in the world, literally, Holi is a Hindu festival celebrated in the Southern parts of Asia, mainly India and Nepal. Referred to as the festival of colors, it is celebrated on Phagu Purnima, full moon day that falls somewhere in February or March. 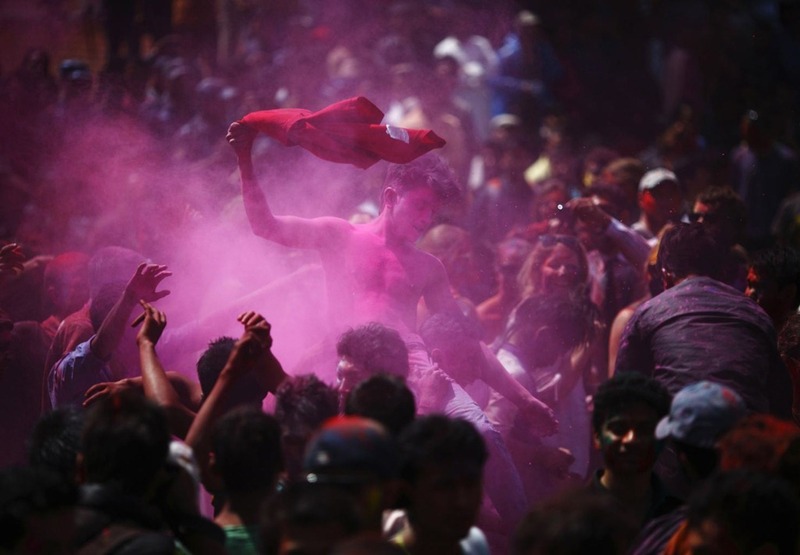 Holi is one of the major, or at least the most awaited and celebrated festival in Nepal. This is the time when people get their groove on and let their hair down. 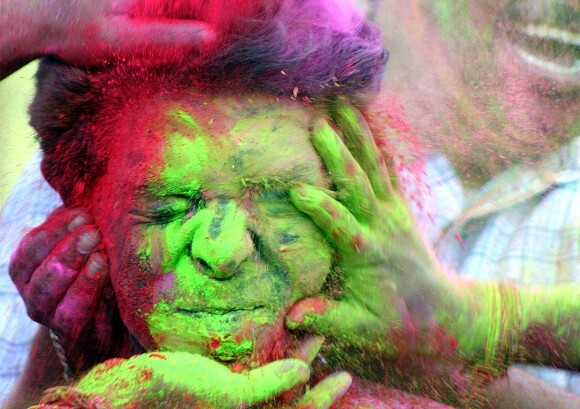 Holi isn’t called festival of colors for nothing, the day of Holi is celebrated with families and friends coming together and playing with actual colors. People use dry colors and apply it to each other for merry making. Also, the use of wet colors and water is found more in the Nepalese celebration than at other places. The adults generally stay at homes and play a lighter Holi, whereas the youngsters roam the streets with painted faces and colorful clothes to get to a friend’s place or any other happening place. The streets themselves run red with vermilion, the most popular color for Hindus and Holi. The thing that epitomizes Holi in Nepal though, especially in the Hilly cities like Kathmandu, are the dreaded water balloons. Known as lollas, these pint-sized balloons are the symbol of the arrival of Holi, and also the bane to the young ladies around the towns. The kids start loading and dispatching these babies weeks before the actual Holi day and making, especially the ladies, its unwanted targets. Girls have to hide and scour for hide outs so that they do not get wet, while going around town; not an act to be proud of but still a face of Holi. Also, the lolla-wars between kids from rooftops of neighborhoods is a sight to behold (also, the set up for most teenage romances, from what I’ve heard.) One thing is for certain, the day you spot a lolla being flung, know that Holi is near. And after the tiring and wet day, bonfires are lit at the night time warming the cold bodies and also symbolizing the death of Holika, the demon who burned to death trying to kill Prahalad, the most famous devotee of Lord Bishnu (for more info go to Wikipedia or something, just saying). This marks the end to the celebrations for another year and end to the dismay of the girl folks all around. This entry was posted in Festivals and tagged Colors, Culture, Festival, Holi, Kathmandu, Nepal on 27/03/2013 by mytrip2nepal. Among the most awaited festivals in the Hindu calendar, Maha Shivaratri falls right around the top. The term Maha Shivaratri literally means “great night of Shiva”. For those of you who are unfamiliar with Shiva, he is one of the three supreme gods in the Hindu religion who represent the three stages of creation – the creator, the preserver and the destroyer or the transformer; Lord Shiva being the most latter. Maha Shivaratri, or commonly just referred to as Shivaratri, is celebrated on the no moon day/night of the month of Falgun of the Hindu calendar in most parts of India and Nepal. The legends behind the celebration of the festival are far and diverse, the most commonly followed being for the gratitude of Shiva swallowing the poison that was set to destroy the universe with no one willing to claim the poison. Another one being where the Parvati, the wife of Shiva, finally got him to save the world with her unconditional devotion and worship. The rituals performed during the day and night of Shivaratri are as diverse as the stories behind it. 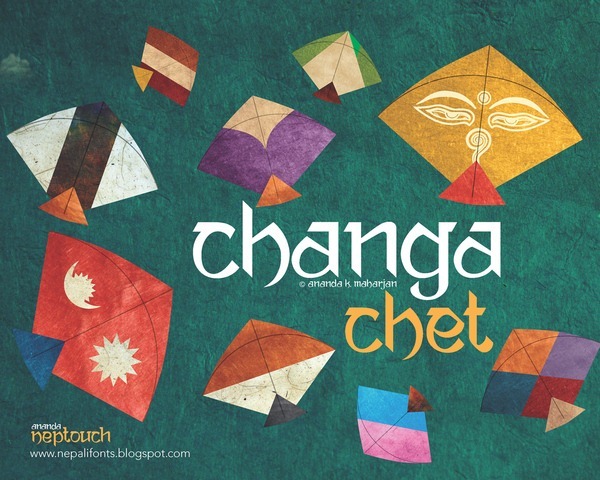 Here I will be writing a bit about the celebration in the Nepalese way. Kathmandu, the capital of Nepal houses Pashupatinath, the holiest Shiva shrine and one of the most famous destinations for all Shiva devotees. It is flocked by more than 100,000 pilgrims from far and wide during Shivaratri, including the range of “Shadus” and “yogis” of different inclination. The day is celebrated with prayers and “pujas” that are said to wash away all the sins of the worshippers. Also, devotees keep a 24 hours fast in the belief of being blessed with the grace of Lord Shiva. One of the most captivating feature of Shivaratri, after all the naked and semi-naked sadhus, is the use of marijuana as a form “prasadh”, loosely translated as a blessed offering after worship. During this day, the premises of Pashupati comes to life with all the sadhus smoking marijuana and all the other visitors that come for the same reason. The consumption is mostly reason with the fact that Lord Shiva had a special fondness over marijuana. 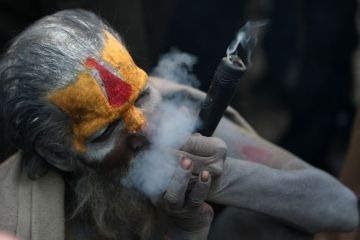 Even though marijuana is illegal in Nepal, the sadhus are allowed to smoke it during the day of Shivaratri, but the police do turn a blind eye even to others during this day. Also, people enjoy another concoction made with marijuana as the base ingredient known as “bhang”, which is a drink made of milk, honey and anything and everything sweet. This entry was posted in Festivals and tagged Culture, Festivals, Nepal, Shivaratri on 10/03/2013 by mytrip2nepal. You heard it right! This has been written in 31st Dec, this is not a time zone thing and we are not a day early. We are, however, in a new year according to the Gurung calendar. You may ask what is a Gurung calendar? Well Gurung is a Nepalese ethnic group in Nepal and well… it is their calendar. 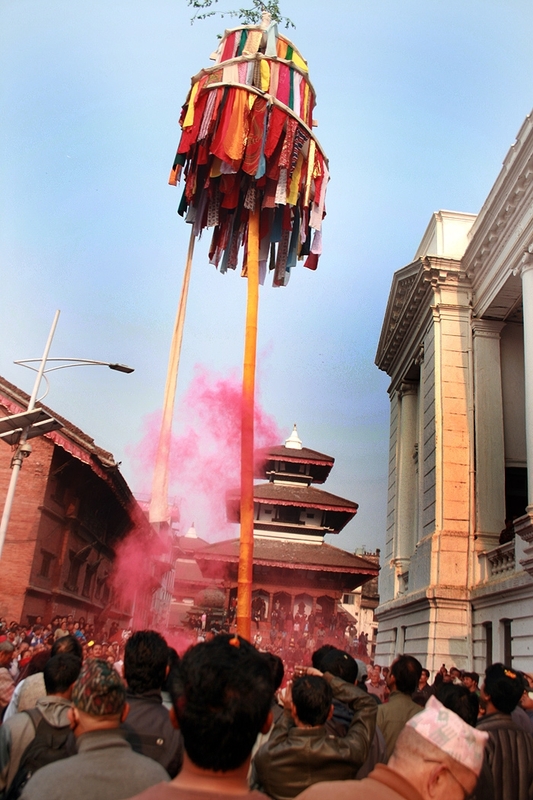 The thing is, Nepal, as small as it is, celebrates at least 6 different New Years. The most commonly known and celebrated around the world, and here too, is the Gregorian New Year’s. There is the official Nepalese calendar known as Bikram Sambat, which has its new year in April. Then, there is the Tibetan New Year’s called Gyalpo Lhosar, the Newari New Year’s and other two separate Lhosars celebrated by the Tamang and Gurung communities. After everything said and done, the best thing about all the New Year ’s Day are all the holidays…. This entry was posted in Culture, Festivals and tagged Festivals, Gurung, Lhosar, Nepal, New Year on 31/12/2012 by mytrip2nepal. Alongside the festivities of Dashain, this year Nepalese are also celebrating Bakra Eid, or more populary, Eid al-Adha. Nepal is a diverse country not only in the terms of natural resources, but also in terms of demographics. Even though many believe Nepal to be a total Hindu populated country, mostly because it was formerly known as the only Hindu Kingdom, it is actually very diverse in ethnicity and religions. Nepal alone boasts 4 million Muslims out of the total population of more than 25 million. Bakra Eid is one of the two biggest Islamic festivals, after Eid ul-Fitr. Bakra Eid is celebrated for 3 days and 2 nights, the last being today, which falls on the 10th, 11th and 12th day of the twelfth and last month of the lunar Islamic calendar. The dates however fluctuate in accordance to the Georgian Calender, shifting almost 11 days earlier every year. This year around, it coincides with another big festival in the country – Dashain. Eid al-Adha is celebrated in the commemoration of the fact that Ibrahim (Abraham) was willing to sacrifice his one and only son at the time Ishmael, with his own consent, in the name of God. Then God, seeing their devotion, switched Ishmael for a ram and passed the test for willingness to follow God’s command. So, during the Eid people sacrifice animals, such as cows, sheep, goats and rams, commemorating the ultimate act of sacrifice, say prayers and wear their new, or at least their best, clothes. The sacrificial meat is divided into three portions, one for the family, another for friends, relatives and neighbors, and the third for the poor and the needy. In Nepal, people throng to the various mosques, the biggest ones being the Jamia and Kashmiri mosques in Kathmandu, to offer prayers and read Namaz, exchange greeting, sacrifice animals and wear new clothes. It is also regarded as a national holiday. This entry was posted in Culture, Festivals and tagged Eid, Festivals, Kathmandu, Muslim, Nepal on 28/10/2012 by mytrip2nepal. OK, we’re back after a long week’s gap with….would you believe it, another festival!!! Nepal has no shortage of festivals, but this time around it is the biggest festival, in context of Nepal or Hinduism for that matter, Dashain. Dashain is known by many names, Bijaya Dashami, Badha Dashain or Dashera, depending on where you are. Dashain is the biggest of the Hindu festivals, celebrated in most of South and South East Asia in one way or the other. It falls between the months of September and October according to the Nepali calendar and depending on the lunar cycle. 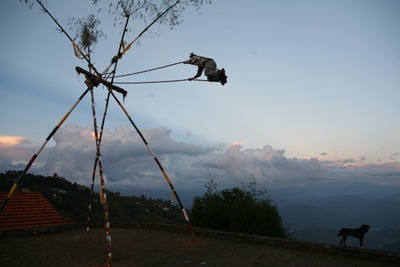 Dashain is the longest running Hindu festival spanning 10 days, the first of which is today. Dashain is celebrated in the name of Goddess Durga, the symbol of power, who vanquished the demon Mahisasurand brought balance to the world. The festival symbolizes the battle between good and evil and finally the victory of good over evil. Even though Dashain is a 10 day festival, the festivities don’t actually start until the seventh day. The first day, Ghatasthapana, commences the festival by people planting Jamara, a holy grass grown by sheltering barley seeds sown in sand from sunlight, in their homes till Fulpati, the seveth day. Jamara is used in Nepal when family elders give blessings and put the tika, a mixture of rice, yoghurt and vermillion, the symbol of Nepali Dashain. Dashain brings with it the festive spirit, as in Christmas for the Christian world. The market gets crowded with frantic shoppers, days or even weeks before the festival, in search of new cloths and the best deals (Dashain is the best time for shopping money wise in Nepal with stores offering huge discounts; that is, if you don’t mind the hordes of people trying to buy the same things.) The charm of Dashain, however is in the kite flying; kids and adults alike indulge in flying kites and more specifically, rooftop kite battles. The colorful kites of all shapes and sizes are thought to push the rain clouds away. Also, bamboos swing of dizzying sizes are constructed in neighborhoods, thought in less numbers nowadays, for all to get their feet off the ground at least once during the season. Regardless of the sight of shoppers everywhere, Dashain is a pleasant time to visit Nepal. People are in warm and jolly mood, the weather is mild with slight inclination to the chilly during the nights and early mornings and the air is cool and crisp. The more you talk about Dashain, the more there is, so expect more blogs on the subject in the coming days. And finally, a very happy & prosperous Bijaya Dashami to you. This entry was posted in Festivals on 16/10/2012 by mytrip2nepal. 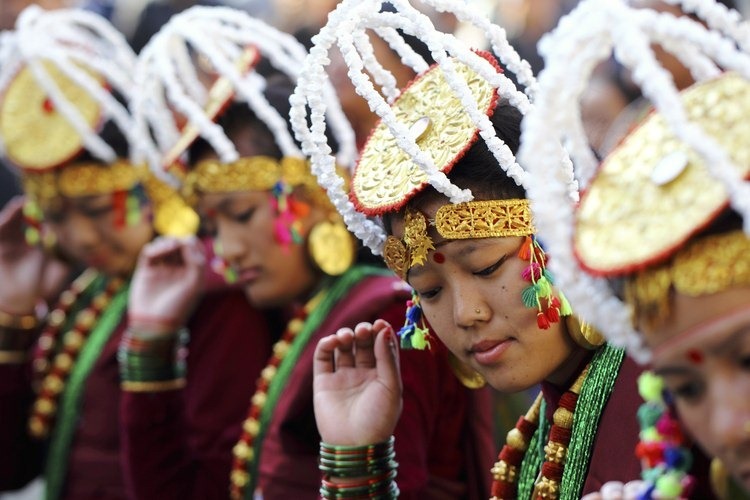 Nepal is a country that loves festivals; people go as far as to say that Nepalese have at least one festival in a week. 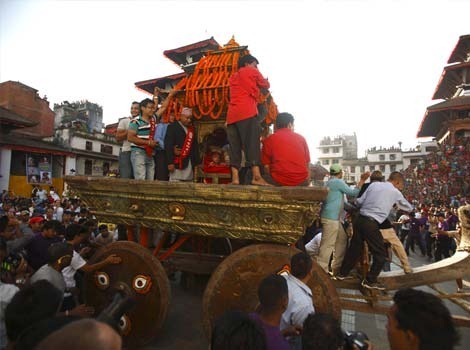 Within all these festivities there is one that the capital city celebrates like non-other –the Indra Jatra. 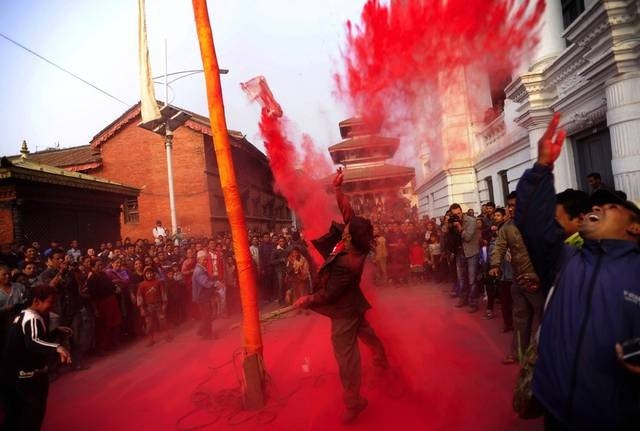 The festival is celebrated in the name of Lord Indra, the king of gods, the god of rain wielding a thunderbolt (equivalent of Zeus in Hindu mythology), which spans for 8 days and is the chief festival of Kathmandu city. However, the most fun and maybe more famous are the Lakhey dances. 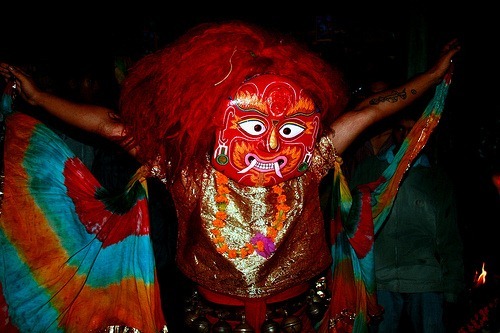 Lakheys are demons, as per Newari myths and during these dances, people mimic them by sporting traditional lakhey masks and costumes. They make their around the old city dancing along with a band of traditional musicians. The masked men are said to be possessed by the Lakheys themselves and become hyper-energetic and immune to fatigue and exhaustion as long as they have the mask on. Among the rumors, it is said that they can digest any amount of aila(newari home made liquor) that they are offered by the worshippers. Once, a friend of mine saw a Lakhey finish a pitcher of aila in one gulp and go on its way. The fascinating thing about this is that after all the performances, the dancers don’t really remember much and transform back to a normal sane person. This seems to be one of those kinds of lore that you can’t prove true or for that matter false. However, amid all these mythologies and legends coming to life, the festival has become a way for the people of Kathmandu to keep hold of their fading tradition and to have a merry time at the same time. 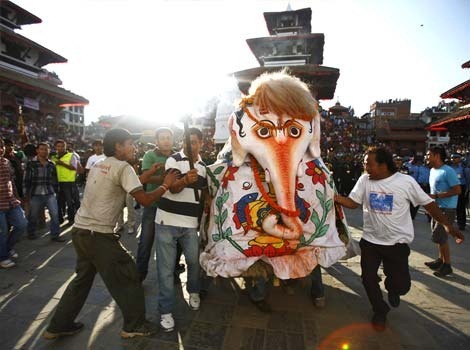 This entry was posted in Festivals and tagged Culture, Festivals, Kathmandu, Nepal, visit on 30/09/2012 by mytrip2nepal.